We all saw it coming. If it wasn't Dubai it would have been Chicago, Tokyo or Guangzhou. For 31 years, just about my entire life on this planet, the CN Tower was the world's tallest free standing structure at 553 metres. The Burj Dubai hotel passed 553 metres overnight, bumping our tower to #2. Say it loud Toronto and say it proud. We're #2! We're #2! We're #2! We're #2! 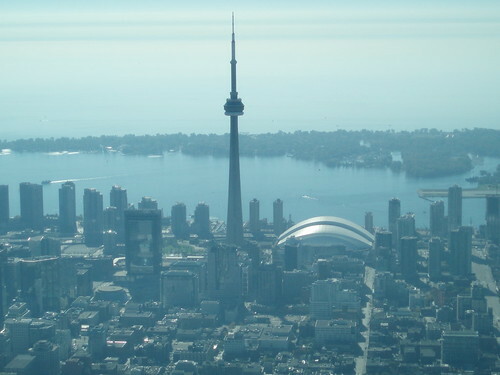 I will say this no matter what City I visit, The CN Tower is the most awesome sight as you are coming into the city. Of course lately that view has been impeded somewhat with all the apartment buildings but standing next to that thing is amazing. I went up into the Tower a few summers ago for the first time and it was even more awesome. I agree with Buffalo Boy, even if I have only seen the CN tower on tv and on pics online.